Are you an online stock trader? Investing in the Philippine Stock Exchange through online brokerage has been one of the most convenient way of buying and selling stocks. You can do it at home or at work as long as you are connected to the internet. Among the famous online brokers in the country are First Metro Securities of Metro Bank, Citisec Online and BPI Trade of BPI. And you may have known that among the three brokerages, BPI Trade is somewhat lacking in capabilities. First Metro Securities has been improving their service through the years providing interactive chats for "technical" traders. Recently they even launched a mobile app to serve their customers well. Citisec Online on the other hand boosts their customers satisfaction by providing useful research and recommendations. 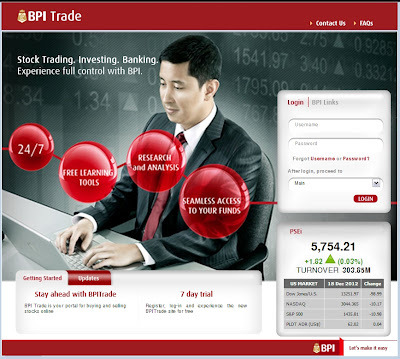 BPI Trade is not excelling even in just one of those. Even their interface looks boring. Man of Steel Trailer 2 is Out, and It Rocks! I'm not a fan of Superman! Well, that statement is already outdated as soon as I heard the news that Christopher Nolan's next project is the reboot of the DC Comics superhero franchise. Why the change of opinion, you may ask. Well, it's purely Nolan. Let me explain a bit about it by recalling some of Nolan's works. Nolan's Dark Knight Trilogy Well, I'm not a fan of Batman too until I saw the movie The Dark Knight. It's all because of the buzz and the favorable write-ups about the spectacular performance of the late Heath Ledger playing the role of the Joker. After watching the movie though, I was convinced then that Batman is a great superhero. Then, four years later comes The Dark Knight Rises. How can I describe it? Ummm...I guess the word "very good" is an understatement. It was one of the best superhero movies I have ever watched in my life. 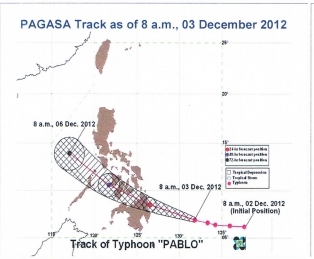 Typhoon Pablo is already in the Philippine Area of Responsibility and is estimated to make a landfall tomorrow, Tuesday. According to the Philippine Atmospheric Geophysical and Astronomical Services Administration (PAG-ASA), At 02:00PM today, the eye of Typhoon Pablo was located at 450km Southeast of Hinatuan, Surigao Del Sur (7.0°N 130.4°E) with maximum sustained winds of 175kph & gustiness of up to 210kph. It is moving West Northwest at 24kph. The storm is expected to hover the Visayas and Mindanao areas in the coming days.